In a development that should give hope to everyone prone to misplacing important paperwork, investigative archivists have finally tracked down the long-missing patent for the Wright Brothers’ original flying machine. It’s been in a cave, turns out. The Kansas City Star has the story. Every now and then, something goes missing at the National Archives. Sometimes it’s been stolen, but there’s always the possibility of a simple misfiling. And then recovery becomes a real nightmare: “If somebody puts something back in the wrong place, it’s essentially lost,” explained National Archives and Records Administration COO William J. Bosanko. Fortunately the National Archives has an “Archival Recovery Program,” which the Kansas City Star describes as a “cold case squad.” Newcomer Chris Abraham stepped forward to take a crack at the case of the Wright Brothers’ missing patent filing, last seen circa 1980. 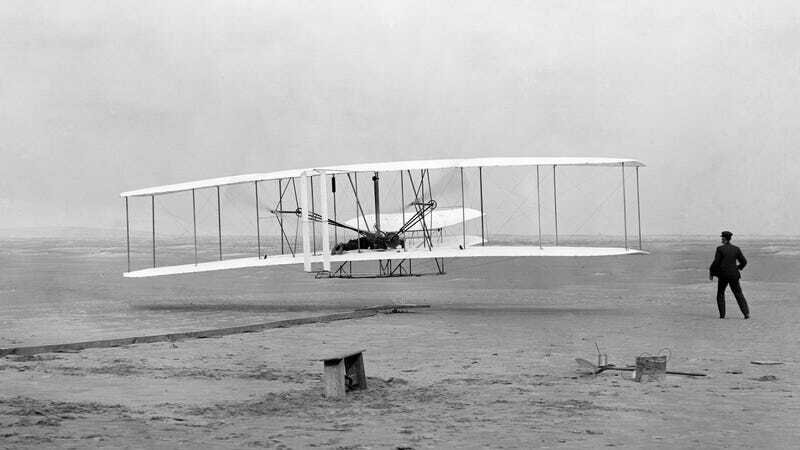 Abraham thought about the Wright Brothers’ less historically significant patents. Maybe the missing file had gotten stuck with them—which are kept with many, many other patent records in 15-foot-tall stacks at the National Archives’ enormous limestone storage cave in Lenexa, Kansas. (Picture the end of Raiders of the Lost Ark.) Abraham called up Bob Beebe, who looked through file after file until—checking one last box—he found the missing patent paperwork. “It was an exciting moment,” he told the Kansas City Star. Anybody else smell an opportunity for a National Treasure-style adventure franchise?